Statue of Basil Cardinal Hume, Newcastle-upon-Tyne. Image by Marie Griffiths / English Wikipedia. 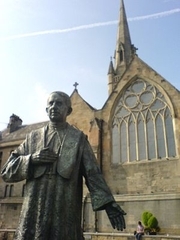 Basil Hume OSB, OM (2 March 1923 – 17 June 1999) was a monk of the English Benedictine monastery of Ampleforth Abbey and for 13 years its abbot until his appointment as Archbishop of Westminster in 1976. His elevation to a cardinal of the Roman Catholic Church followed during the same year. From 1979 Hume served also as President of the Catholic Bishops' Conference of England and Wales. He held these appointments until his death from cancer in 1999. His final resting place is at Westminster Cathedral in the Chapel of St Gregory and St Augustine. Basil Hume is currently considered a "single author." If one or more works are by a distinct, homonymous authors, go ahead and split the author. Basil Hume is composed of 8 names. You can examine and separate out names.